Using smaller vessels that allow access to shallow, nearshore waters, researchers from Stony Brook University and the Southwest Fisheries Science Center conducted the first multi-year survey of the population of Antarctic krill (Euphausia superba) in coastal waters near Livingston Island and discovered that nearshore waters had significantly higher krill biomass density than offshore waters. They also found that the nearshore waters had less interannual variation than offshore waters. These findings were published in the July issue of the Canadian Journal of Fisheries and Aquatic Sciences. Antarctic krill are tiny shrimp-like organisms that are an integral part of the Southern Ocean food chain. Krill are an important food resource for penguins, seals, and some whales in the Southern Ocean, and are harvested for use in aquaculture feed and human dietary supplements. "Nearshore krill biomass is generally most accessible and attractive to land-breeding predators as well as to human fishers competing for this valuable resource," said Dr. Warren. Because large research vessels cannot safely travel in shallow nearshore waters, previous population surveys of Antarctic krill were restricted to offshore sampling. 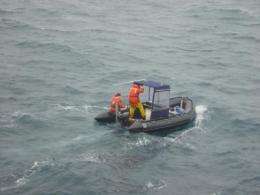 With funding provided by the National Science Foundation Office of Polar Programs and the United States Antarctic Marine Living Resources program, Dr. Joseph Warren, assistant professor in the School of Marine and Atmospheric Sciences at Stony Brook University, and Dr. David Demer, leader of the Advanced Survey Technologies Program at the Southwest Fisheries Science Center, conducted six acoustic surveys from small boats in the nearshore waters north of Livingston Island, Antarctica. 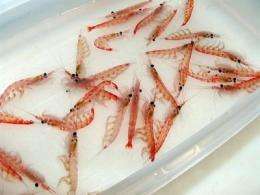 From 2000 through 2007, they examined the abundance and distribution of Antarctic krill in coastal waters within several miles of shore. Deploying their scientific equipment from a 6 m inflatable boat, Warren and Demer were able to carry out their measurements in water ranging from 500 to 2 m in depth. They compared their observations in the nearshore waters with those from offshore surveys of the western Scotia Sea conducted during the same year. "Although the spatial area of our nearshore survey is quite small when compared with that of the entire Scotia Sea, the high and stable densities of krill in shallow water may be more important ecologically than the offshore krill," said Dr. Warren.